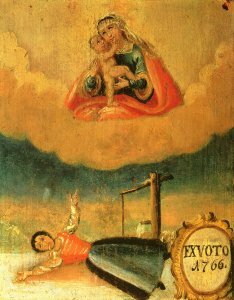 The naive picture on the votive tablet is painted onto wood and is only 26 x 31 cm. It portrays a girl with the falling sickness who has apparently had a fit while going to fetch water. She is lying stiffly on the floor with her arms stretched out like a doll which has been dropped onto the floor; froth is dripping out of her mouth. The woman who has been called to help is the Virgin Mary, who carries the baby Jesus in her arms. The circle of clouds in votive tablets symbolises the division of heaven and earth. It is usually peopled by saints, who, as advocates, form a link between the suffering people on earth and the helping, healing God in heaven. red is regarded to be the colour which wards off demons; black stands for sin and punishment.